In the wake of the more than 16-hour Sydney siege by a self-styled Muslim cleric, former Australian Prime Minister Kevin Rudd told CNN's Christiane Amanpour on Monday that jihadism is a challenge that concerns all, and tackling it requires collective effort. Early Tuesday, Australian authorities stormed the Lindt Chocolate Café, where a gunman identified as Man Haron Monis had been holding hostages for some 16 hours. Monis was shot and killed, and two of the 17 hostages died. When Malaysian Airlines flight MH17 was shot down there were 298 people on board - almost forty of them Australian. Australian opposition leader Bill Shorten told Amanpour that the Australian government will call for answers to this tragedy in one voice. "On this matter there is no internal political debate in Australia. We are united in our grief and we are united to get to the bottom of what's happened." It is a point of union in the otherwise contentious arena of Australian politics. But the opposition leader has not taken his focus off other issues that impact Australia and its future, particularly climate change. Prime Minister Tony Abbot's current leadership has led to a unique unwinding of global warming legislation by becoming the first country to repeal a carbon tax law. It is a decision Shorten vehemently opposed and one he fears will affect people far sooner than they think if no action is taken. Part one of Christiane Amanpour's conversation with Former Australian Prime Minister Julia Gillard. Part two of Christiane Amanpour's conversation with Former Australian Prime Minister Julia Gillard. Allegations that Australia spied on the Indonesian president’s phone are a “big issue” for the two countries’ relationship, former Australian Prime Minister Julia Gillard told CNN’s Christiane Amanpour in an exclusive interview conducted Tuesday and aired Thursday. It was her first news interview since being forced from power by her own party earlier this year. As fallout from NSA leaker Edward Snowden’s revelations landed in Australia, Indonesian President Susilo Bambang Yudhoyono froze military and intelligence gathering with his Australian ally. 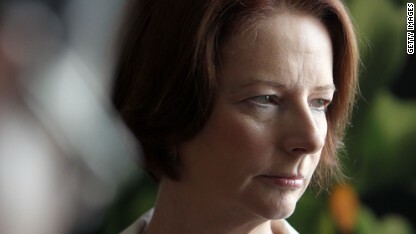 Gillard's successor, Prime Minister Tony Abbott, has refused to apologize for the alleged spying, but has expressed regret for the embarrassment that media reports have caused to Indonesia. 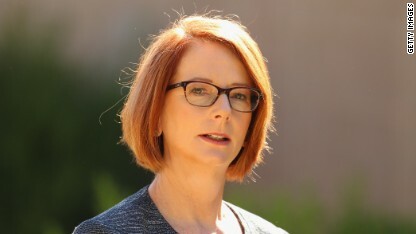 Though Gillard said it was “not appropriate” for her to comment on “intelligence questions,” she praised U.S. President Barack Obama’s reaction to similar allegations that the U.S. spied on German Chancellor Angela Merkel. Will politics exacerbate Australia’s raging wildfires? It’s not supposed to be fire season yet in Australia, where summer hasn’t even begun. But more than sixty devastating bush fires are already raging in a ring around Sydney. Though it is unclear that climate change directly caused these wild fires – police arrested two teenagers for starting two of the Sydney fires –local officials do fear those hot, dry, and windy conditions this week could exacerbate the situation. In the past 12 months, Australia has lived through the hottest summer, in the hottest year, on record. “There is a real political debate about how to deal with this issue of climate change,” Stan Grant, international editor of Sky News Australia, told CNN’s Christiane Amanpour on Monday.